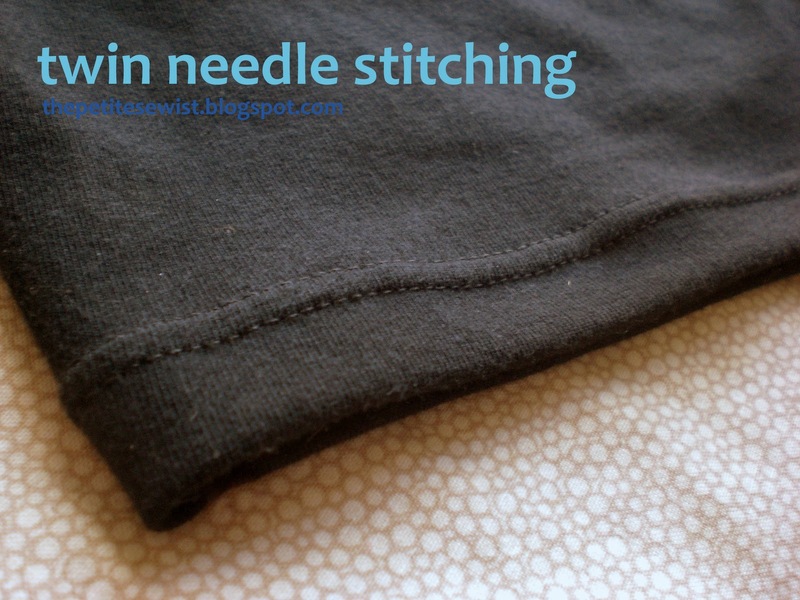 This week I whipped up my very first knit project on my new serger. I started with something simple, and hopefully fail-proof. I made some knee-length leggings using McCall’s 6360 Misses’ Leggings pattern. Luckily, I already had some nice cotton/poly spandex leftover from this project so I got to work. The pattern was so simple I didn’t read the instructions at all. If you have made pajama pants – and I have made more than my fair share – you can make a pair of stretchy leggings. if I’m not alone.—) Instead of making a casing for the elastic, I folded the upper edge of the leggings under 1″ and placed my elastic loop in the fold. I pinned the fabric to the elastic evenly, all the way around the waist. Having previously finished the edge with my serger, I just needed to secure the fabric to the elastic was a line of stitching. With my twin needle, I stitched near the bottom edge of the elastic in a circle. I bought a twin needle for this project because it is needed to finish the edges of the jersey. (That is, unless you have a coverstitch machine….which I don’t. If you do, we should be friends!) 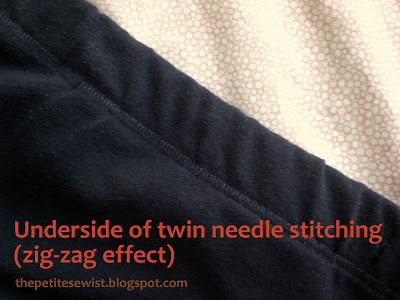 The advantage of a twin needle is that it builds stretch into the stitch by having two parallel rows of stitching on the top of the fabric and a zig-zag stitch on the underside. All you have to do is use two spools of thread on top, thread one in each of the needle eyes, thread your bobbin normally, and you’re good to go. I used a 5/8″ hem on the bottom edge. I chose a 3mm stitch length and slightly stretched the fabric in front of the presser foot. After reading more about knits, I realized I should have stretched a bit in front and behind the presser foot when I sewed this hem. I tried this second method on a test piece of fabric and the fabric didn’t look one bit wavy. I’ll use this method next time. All in all, the finished result is still a lot more even than just a single row of stitching. My only complaint about this pattern is that the edge of the leggings doesn’t hug my knees like they do in the pattern envelope. But…I do love my new leggings and can’t wait for it to get warmer so I can go walking in them. I am not quite as afraid of knits as I used to be and love how quick and easy this project was. It took only a few hours to complete!! I am totally use this pattern again. I think the leggings came out great and I'm going to run out and get this pattern. I would love to make some new workout pants. I wonder why it didn't hug your knees. Maybe they used 100% spandex?? 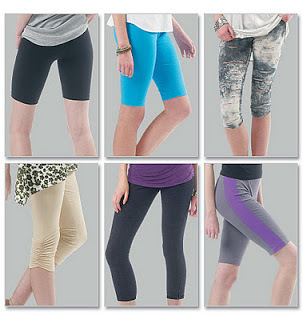 Thanks for the thought about the spandex…I bet you're right! And thank you for following my blog. I really appreciate it! No problem. I picked up a bunch of patterns at Joanns for summer dresses. I will keep you posted on how those go. Also, I'm on the hunt for men's patterns too. I made my husband a button down shirt that he loves and I will soon be making him some lounge pants. I can't wait to see what you make from patterns too. Thanks for being so friendly too. You will see that a lot of bloggers are very friendly and very helpful. Have a great night!! P.S. In response to your question on nicely priced laminated cotton on my post: check out one of my sponsors, Just Laminates (https://www.etsy.com/shop/Laminates). Her prices are under $15/yd and she's got an excellent selection of cute prints (and is super sweet too)! 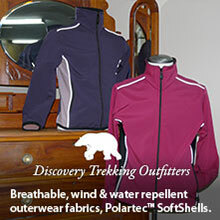 I checked out your sponsor and she has great prices…and such cute fabric. I'll have to buy a yard of laminate cotton and make a little lunch bag in a few weeks! Thanks! These look great! Nice job on the double stitching! Your leggings turned out great. Does this pattern have side seams, or just the inside leg seam?